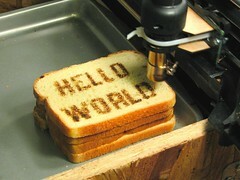 On Saturday, I attended Startup School 2009, hosted by Y Combinator. I’ll have a future post on the event, which was amazing, and had a lot of helpful tips on things very relevant to the MightyBrand audience, including marketing, customer service, and changing the world. Anyway, one of the biggest things that struck me when hearing from the speakers, including people like Mark Zuckerberg (Facebook), Paul Buchheit (Gmail, Friendfeed), and Evan Williams / Biz Stone (Twitter) was this: they launched very rough and ugly first versions of these projects in just a few days and iterated from there. These companies and products are now worth billions of dollars, but they started as small hack jobs that were designed as a quick, fun experiment. So in that spirit, I’ve decided to launch a quick little plugin that I built Saturday evening, after the event was over. I’d been thinking about how I’d like something like this plugin, but I couldn’t find anything, so I decided to just sit down for a couple hours and knock out the roughest, hackiest version that would still provide some value. I definitely nailed the first part (the code is ugly), but you’ll have to tell me if it adds any value for you. The plugin is called MightyReach for WordPress, and just like MightyReach.com will do when we launch, this plugin allows you to measure your overall social media “reach” from one place, in this case, from your WordPress dashboard. In keeping with the principle of releasing early and often, it currently only covers Feedburner and Twitter, but we have a long list of other services we’d like to cover, including Google Analytics, Youtube, Facebook, Bit.ly, and more. We also have a lot of feature ideas, but with both supported services and features, we’re more interested in what you have to say, so please contact us and let us know what you’d like to see. Got customers? 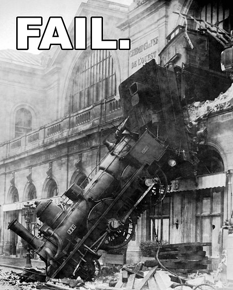 How we almost sunk our startup before it started. Brace yourself kids, because this is a tale of unrequited love, interminable woe, and eventual redemption (no, it’s not about high school). But the redemption doesn’t happen for awhile, so pour a double whisky and shut the blinds so no one mocks you for your tears. I’ve already written about how MightyBrand started, so I’ll summarize in this post by saying that in early 2008, we got the idea to build a platform for monitoring social media and helping companies engage with their customers. This seemed like a great idea to us, and we had a lot of code from a previous project that we could repurpose for the cause. It’s been a crazy summer, both good and bad, and Ben and I are ready to start talking. We’ve been hard at work on some exciting stuff, as well as dealing with some of the crazy things life throws at you when you bootstrap a company. We’re going to be launching a bunch of new initiatives and stuff that we think our customers will be really happy about, but we’re also going to be using this blog and other marketing channels much more heavily to connect with our customers, many of whom are entrepreneurs as well. We’re going to be more transparent, more authentic, more open about the challenges and risks of doing what we’re doing and where we’ve failed. We’ve learned some very important things that I’m incredibly excited to share and discuss with our readers, so please stay tuned. Our first post will be up tomorrow morning, so go ahead and subscribe to our feed or follow us on Twitter so that you don’t forget to check us out. Yes, that’s some blatantly cheesy sales-letter copywriting But I’d hate to give it all away now, so please stay tuned and let us know if you’d like us to cover anything in particular! PS – Thanks to Luke Fretwell for guidance on our new blog design. We love it…do you? Short version: we’re launching a new web application called MightyReach that lets you create a customized dashboard of all your web and social media stats. Check it out and sign up to be notified when it launches! Someone over on news.ycombinator.com posted a story asking startups how they came up with their name. I posted a comment there for MightyBrand, but I thought I would cross-post it here, in case someone else finds it interesting. The story of our name is a tale of the sunk cost fallacy. Back in 2006, we started working on a social network aggregator called BlueSwarm that was very similar to FriendFeed or SocialThing. We originally called it BlueSwarm.org, because the .com was taken, but just before we launched in Summer 2007, we bought the .com, paying way more than we should have. Stupid. Anyway, the launch went OK, we got some press, but after awhile, we realized that the space was crowding fast and it was a difficult idea to monetize, so we put it on the back-burner. Meanwhile, we launched a little side blog called MightyBrand that covered personal branding through social media. We posted there occasionally, but not much. It was one of those spur-of-the-moment ideas you do on a weekend that gradually lose steam over the next few months. In early 2008, we decided to take the codebase from BlueSwarm and re-purpose it to be a social media monitoring platform for brands. This is where the sunk cost fallacy comes in: because we paid so much for the BlueSwarm.com domain, we really wanted to use it, so our social media monitoring platform for brands and companies was also called BlueSwarm. We went through these mental marketing gymnastics trying to relate it to what we were doing: “Who’s swarming around your brand?” We launched an alpha prototype under BlueSwarm and applied to YC as BlueSwarm. Finally, about six months later, we realized that it probably wasn’t the best fit, and it suddenly dawned on us that MightyBrand was actually a pretty good name for what we were attempting to do, and would grow with us as we expand beyond monitoring. So when we launched our public beta in Jan, we completely re-branded as MightyBrand. The lesson? Don’t hold on too tightly to a domain, name, idea, or project just because you’ve spent a lot of time and money on it. If the future for it doesn’t look good and you have something better on the table, go for it. I was kind of a nerd in high school (shocker, I know) and I was constantly reading books on technology and business. One of the ones that I found fascinating at the time was The Cluetrain Manifesto, which asserted that the Internet is a global conversation that allows consumers to break down barriers and subvert hierarchies, making them faster and smarter than the companies trying to sell to them. This was the late 90s, at the height of the bubble, so everything related to how the Internet was going to change business was heralded as brilliant and flew off the shelves. Then the bubble burst and opinion swung the other way for awhile, leaving things like the Cluetrain Manifesto in a dusty bin at the local Goodwill. That’s where I come in. I love to read science fiction, and I usually just buy paperbacks from the Goodwill down the street, read them, and then donate them back. A few weeks ago, I was there browsing and I stumbled across a copy of the Cluetrain Manifesto. Remembering vaguely that I had really enjoyed it the first time, I flipped through it for a few minutes. I was immediately struck by how relevant it sounds today. It reads like it was written for 2009, not 1999. We’re right in the middle of the “social media” craze and businesses are scrambling to try and determine how to use things like Twitter and Facebook to accomplish their business objectives. More than ever, the market actually is a global conversation. I decided to do a blog series on the book and how it applies to social media marketing in 2009. The book is organized into 95 theses, which can be broken down roughly into eight groups. In the coming series, we’ll cover all of these groups and bring you examples of companies who have done it right, and others who still don’t get it. Make sure you grab our feed to get updates as we go! 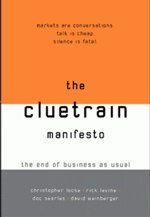 PS – If you have any thoughts or memories of reading the Cluetrain Manifesto back in the day, post them in the comments! 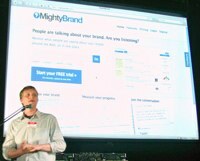 Earlier this month, I had the pleasure of presenting MightyBrand to SF New Tech, a monthly startup event in San Francisco. My presentation skills still need work but I really enjoyed it and we saw a big surge in signups and partnership requests. A big thank you to Myles Weissleder and everyone else at SF New Tech for the opportunity. I was also interviewed by Jolie O’Dell for Startup Lucky. Check out a few pictures and the interview below! Note: To any event producers out there, we’d love to demo MightyBrand for your audience and talk about how to build strong brands online using social media. Just contact me at ryan@mightybrand.com. We pushed a big redesign of MightyBrand (and this blog), including a new brand with color scheme and logo, done by our good friend Luke Fretwell. We’re really excited about the redesign and we’d love to know what you think. Post in the comments! We’ve spent the last two months working on some massive architectural improvements to allow the site to continue to scale and grow as more and more users signup. You should see a big improvement in the speed of the site compared with the last few months. You can now check your brand’s social mentions right from the MightyBrand homepage, just to get a taste of the value that we add. Check it out! A few weeks ago, I was thrilled to be asked to present MightyBrand to a couple hundred attendees at SF New Tech. The event went well and I’ll be posting about it later today, so stay tuned. We’ve been hard at work on some really exciting partnership opportunities that we hope to be announcing very soon. In the meantime, if you’re an agency or marketing firm and you’d like to offer MightyBrand to your clients, please contact us and discuss it. We’ve got some great solutions that we’d love to tell you about. Check out our partners page or contact us for more info! We launched an experiment in micro-monitoring called MightyTweets. You can now get notified via Twitter when someone mentions your brand on blogs, forums, Digg, and Twitter itself. For more info and to try it out, just follow @MightyTweets. MightyBrand exists for you and we were able to spend a lot of time in April getting to know our customers and understanding how we can help build great brands. There’s nothing we’d rather be doing, so please contact us. Thanks for making it such a great month…we’re really excited to see what May has in store! This morning, our system sent out a batch of emails that were not intended for public consumption. The intent of the email was to show users who hadn’t visited their MightyBrand account in awhile what kinds of mentions they had been getting in their absence. Unfortunately, there was a bug in the system and instead mentions for a very small subset of the brands we track was sent out. We’ve identified the exact issue and taken steps to correct the immediate problem. We’re going through all of our email code to ensure there are no other major bugs. We’re re-evaluating our procedures for testing new features across the entire app. We’ve tried to contact those affected by the error; please contact us if we missed you. Again, we’re sorry that we made this mistake and we’re hard at work to make sure it never happens again. We completely understand if you’re upset (we are); If you have further concerns or questions, please contact us at support@mightybrand.com or call me at the number below and we’ll make it right. It’s done. We finally closed down BlueSwarm.com and redirected all the traffic here, which is a bittersweet moment. BlueSwarm was the first prototype of MightyBrand and we really enjoyed building it and working with all the early users who tried it out. Ultimately, though, we felt that MightyBrand was a better representation of the type of value we’re adding. If you were one of the original users on BlueSwarm, thanks again for your feedback and testing of our early efforts. It meant a lot to us and we hope you’ll find even more value on MightyBrand.